It took 51 years for the California Historical Society to find a permanent place in the history of California and another 57 to be adopted as the official state historical society of the State of California. The idea to establish California Historical Society began in 1871. There was talk, but not much else until 1886 when a concerted five-year effort was launched. The struggle for viability continued to 1891, and faltered. A partnership with the California Genealogical Society in 1902 seemed promising until 1906 when disaster struck. The San Francisco earthquake of that year put the idea away for 20 years. In 1922, a benefactor by the name of C. Templeton Crocker resurrected the California Historical Society and supported the organization until it was able to provide for its own financial stability. The Society hired its first paid staff member in March, 1923 and held its first exhibition in 1924. The Society had gained a permanent toehold in the State of California. 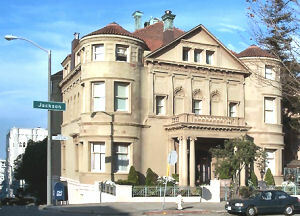 In 1956, after Mortimer Adler's Institute for Philosophical Research moved out, the Society established residence in the Whittier Mansion on Jackson Street at the corner of Laguna Street in the Pacific Heights neighborhood of San Francisco. 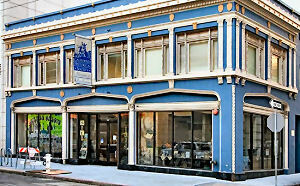 They remained at this location until 1993 when the move was made downtown to its current Mission Street address, in the Yerba Buena Gardens neighborhood, where it resides in the former San Francisco Builders Exchange and hardware store. But, while residing in the Whittier Mansion, Senator James Mills introduced Senate Bill No. 63 (SB 63) promoting the California Historical Society as California's official state historical society. It was smooth sailing for this bill, first read in the Senate on January 2, 1979. With the unanimous approval of the Senate on February 16, the legislation advanced to the Assembly. The Assembly produced one no vote to 74 yes votes on April 26. On May 9, 1979, Governor Jerry Brown signed the legislation making the California Historical Society the official state historical society. An act to add Section 429.5 to the Government Code, relating to the state historical society. 429.5 The California Historical Society is the official state historical society. SEC. 2. In declaring the California Historical Society to be the official state historical society, the Legislature does not intend to establish a new state agency but is merely designating the California Historical Society as the state historical Society. As you can see, the legislation was very clear that the California Historical Society wasn't becoming a state agency. 429.5. The California Historical Society is the official state historical society. Source: California State Legislature, California Law, , March 4, 2008. Source: The California Historical Society, March 4, 2008. Source: The California State Library: History and Culture, State Symbols, , March 4, 2008. The California State Historical Society: The California Historical Society inspires and empowers Californians to make the past a meaningful part of their contemporary lives..